Kevin Annett: A Modern Abuser Of Residential School Survivors…If Blackwater’s residential school tragedy wasn’t bad enough--it got worse when he crossed paths with Kevin Annett. Blackwater didn’t think very highly of Annett’s meddling with the affairs of residential school survivors. Blackwater told a reporter at the BBC that he resented that Annett, a white man who had never attended a residential school, had become the public face of the dead children. He stated that Annett had “disgraced” native people with his publicity seeking. Kevin Annett has been denounced by people of at least six indigenous nations--and, each time, he followed the pattern of responding with hate, slander and malice. His claims that he is supporting indigenous communities are nullified each time he does this. He doesn’t know when to stop--instead, he leaves a trail of hurt in his wake.Comment: For more on boarding schools, see Phony Pro-Gun Indian Image and 3,000 Native Children Died in Residential Schools. 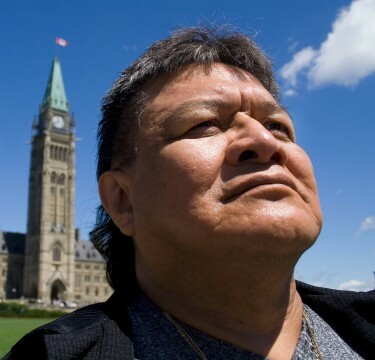 Below: "Willie Blackwater--residential school survivor."